Last Thursday, on the way home from work, I stopped and bought 1/2 bushel of peaches. I was planning to freeze most of them like I did last year, and I left them sitting on my counter for a few days to ripen a little more. Of course, that meant that every time I went in the kitchen I was forced to contemplate a huge basket of peaches. 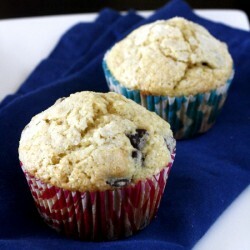 And of course that meant I spent my free time on the internet searching “peach recipes”. 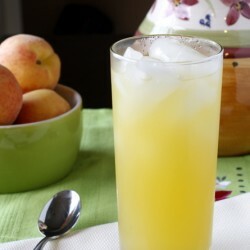 The result of my little internet search is the peach lemonade you see here. This stuff is amazing. And I don’t say that lightly. I can’t seem to stop drinking it, and yet I want to hoard it as well! I had no idea it was so easy to make your own flavored lemonade, and now I’m regretting not trying a strawberry or blueberry version back when those were in season. 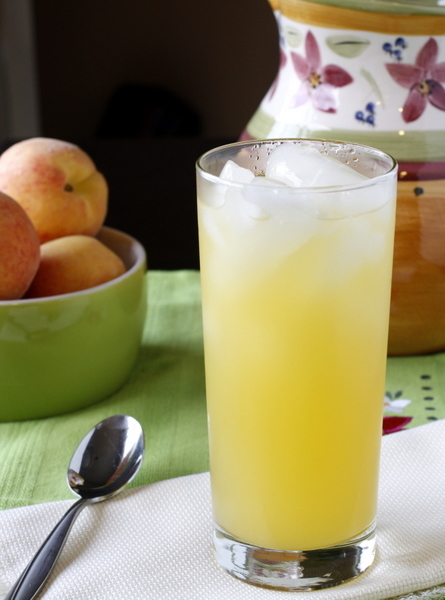 The lemonade is perfectly sweet with a wonderful peach flavor shining through. 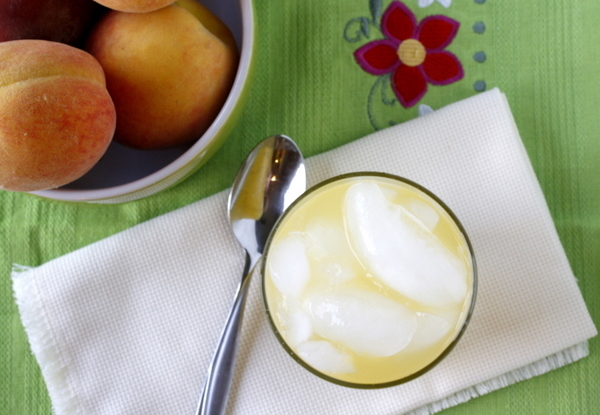 If you like the flavor of fresh, in-season peaches, you’ve got to try this – it’s definitely a favorite in our house! Bring the peaches, sugar, and water to a boil, and then simmer until the sugar is dissolved, about 10 minutes. 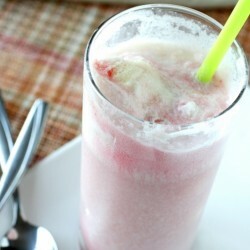 Using an immersion blender (or transferring the mixture to a blender), blend until smooth. Strain through a fine mesh strainer into a large bowl or pitcher, pressing to extract as much juice as possible. Let cool completely then stir in the lemon juice. Serve over ice. How do you peel peaches. I just peel them with a knife, like I would peel an apple. When they’re ripe they’re pretty easy to peel. This sounds yummy! I should pick some peaches up my next shopping trip. Yum! I can’t wait to try this, sounds so good. I too, love the new design! Wow, this sounds delicious!! 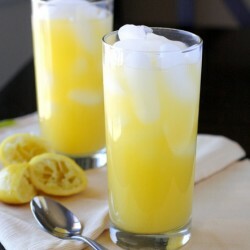 I’ve never thought of making my own flavored lemonade, what a great idea! I wonder if I could switch out the sugar for agave? Thanks Katrina! And really, Lindsay (Purr Design) did it all – I did nothing! What do you mean when you say you’re updating your feed…do I have to tell other people to do that too? i got on here to say that candy made this yesterday and brought us some. IT WAS AMAZING!!!!!!!!!!!!! i could have had an entire pitcher’s worth! and while i’m here, i do love the new design! it looks so clean, fresh, and simple. professional, too:) love it! 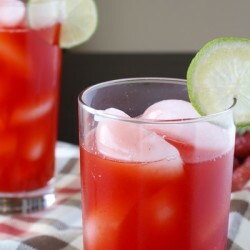 Sounds so refreshing and a nice change from lemon! I love peach yea but never thought of peach lemonade. Sounds so refreshing!